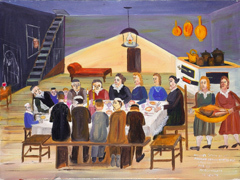 The Jewish Museum presents an exhibition of paintings by Mayer Kirshenblatt, based on his childhood memories of prewar Poland. Your little genius can’t remember where he put his backpack five minutes ago, but Mayer Kirshenblatt, 93, recalls minute details from his childhood in Apt (now Opatów), Poland. At age 73 Kirshenblatt taught himself to paint and began composing scenes based on his early memories for his daughter, Barbara, who’d requested stories about his youth. Dozens of his works will be on view starting this month at the Jewish Museum. Expect a ferocious battle of the generations raging across New York's Bowery . . . As two group exhibitions pitch the very centuries against each other. At The New Museum a show entitled "Younger Than Jesus" gathers artists born in or after 1976, making them 33 at oldest . . .
"Wiser Than God" presents worldwide working artists born in or before 1926, making them 83 at very youngest . . . Some are considerably older, many born before the First World War, and several are amongst the most famous artists at work today including Hyman Bloom, Dorothea Tanning and Carlo Nangeroni, currently the most expensive living artist. Indeed with a set of artists whose cumulative age might add up to a total of almost 5,000 years, the opening vernissage should hop. "Wiser Than God" runs from May 27th until July 31st overlapping with the current blockbuster Gagosian Picasso show, featuring work made by that artist between the age of 83 and 92. Katherine R. Jolluck reviews They Called Me Mayer July in Biography 31:4 (2008):756-758. This is a truly remarkable book—as are the story of its making and the world that inspired it. Through descriptions, anecdotes, sketches, and paintings, Mayer Kirshenblatt recreates the daily life and culture of a small Jewish city in Poland before the Holocaust. It is a world remarkable in part because of its complete destruction by the Nazis, but also because of the richness of its characters and customs. “What I’m trying to say,” Kirshenblatt explains, “is ‘Hey! There was a big world out there before the Holocaust. There was a rich cultural life in Poland as I knew it’” (353). He fulfills his mission with insight, affection, and vibrancy...This is a truly valuable creation—informative, colorful, moving, funny, and at times, sad...With this book, Kirshenblatt restores and celebrates the life and culture that characterized prewar Apt, ensuring that others can share some part of it, long after he and the other surviving inhabitants have passed away. Read whole review. "...extensive, engaging historical and artistic contribution to Jewish culture and Polish history, as well as the ethnography of memory and the art of narrative"
Barbara Rylko-Bauer reviews They Called Me Mayer July in Anthropological Quarterly 8:2 (2008):505-509. "...Through his recollections and stories, illustrated with over 200 paintings and drawings, full of remarkable details of daily communal life, Mayer Kirshenblatt offers us a unique window onto a world that no longer exists. And it is this latter fact that also makes this book an important contribution to our under standing of the Holocaust and the degree to which it succeeded in erasing a life-way, a culture, a history, a community..." Read whole review. "...mediating youthful experience through adult recall..."
Carol Zemel reviews They Called Me Mayer July in a special issue of Bridges: A Jewish Feminist Journal 14:1 (2009):154-160, dedicated to fathers and daughters. Reprinted with permission. Subscribe to Bridges. Like Herman Melville's "Call Me Ishmael," the salutary title of Mayer Kirshenblatt's They Called Me Mayer July sounds a ringing introduction to the figure who will guide us through a lively personal and cultural history. Though this is the story of a man looking back (Kirshenblatt was 91 when the book was published), the tale is told through the character of an adventurous, hot-headed (hence the nickname, after July's heat), and inquisitive adolescent—just the sort of guide the reader/viewer wants...Mediating youthful experience through adult recall, pictures like this invite careful perusal and discovery, and so demonstrate the importance of images in the formation of memory and memoir. Read whole review . Financial times calls the exhibition "vivid, engagingly autobiographical"
For nearly 40 years, Mayer Kirshenblatt ran a paint and wallpaper store in Toronto. If you had assured him then that New York’s Jewish Museum would one day devote a show to his paintings of life in the Polish village where he grew up, he would probably have answered rudely. In fact, there were no such paintings. Kirshenblatt waited until he was 73, retired and depressed, to launch his artistic career. He developed quickly enough to furnish the museum with the vivid, engagingly autobiographical They Called Me Mayer July: Painted Memories of a Jewish Childhood in Poland Before the Holocaust. Kirshenblatt nurtured his own recollections, which predated the Nazi horrors. He remembered the layout of the streets in his native Opatów, the stalls of the weekly fish market, the rich kleptomaniac who secreted fish in her bra, the washing and rinsing of laundry, the way prostitutes hoisted up their dresses to display their wares. In 1967, he began describing these vignettes to his daughter Barbara, who was studying folklore at Berkeley and went on to a distinguished academic career. For decades, she recorded her father’s reminiscences and colluded with the family to buy him brushes, pigments and canvases. But he refused all pleas to commit his memories to paint – until 1990, when he finally unearthed his gifts, both material and internal, and produced a portrait of himself as a child in the family kitchen.